Around the year 2000, Ilhem discovered the electronic music .She used to go to some free parties and tecknivals …Then, she started to play with vynils records,but the atmospher around was to phallocratic.So she took place among the public like a dancer. 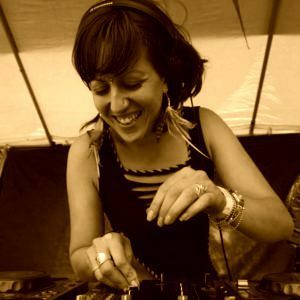 Native from Grenoble, which is the place of the biggest french trance festival, named Hadra; in 2003 she started to be interested in this kind of music. It was a revolution for her. In the fellowing year,with some crews (Crystal 27 ,Cortical Systematic crew,or Oobe ), she dealt with organisation of events. After a while, in 2011, she came back behind the cd players, in order to play some groovy and progressive music and melodic techno. She got fed up with all those “dark, psyko”stuff. Her music is a subtil mixture between organic sound, accoustic and voices vibrations, based on progressive beat, 100 -143 bpm. She likes, whit her set to tell you a tribal story. So, she started a new carrer as a Djane, which brought her to many places in france, like, Paris, Marseille, Nancy, Toulouse… Djane DECIBULLE was born !! !